Lucky for you, the new Nutrition for Weight Loss Surgery Meal Plans Book has answers to all of the above + MORE of your frequently asked questions completely covered. Seven day meal planners developed by weight loss surgery dietitians specifically for people who have had weight loss surgery – not the general public! 21 breakfast, lunch and dinner ideas that are high in protein, balanced with low GI carbs and full of flavour. Meal ideas and inspiration that will motivate you to get creative in the kitchen. Totally flexible 1,000, 1,200 and 1,500 calorie plans that will enable you to build your own menu to suit your preference. Endless potential to personalize the plans to your tastes and tolerance. 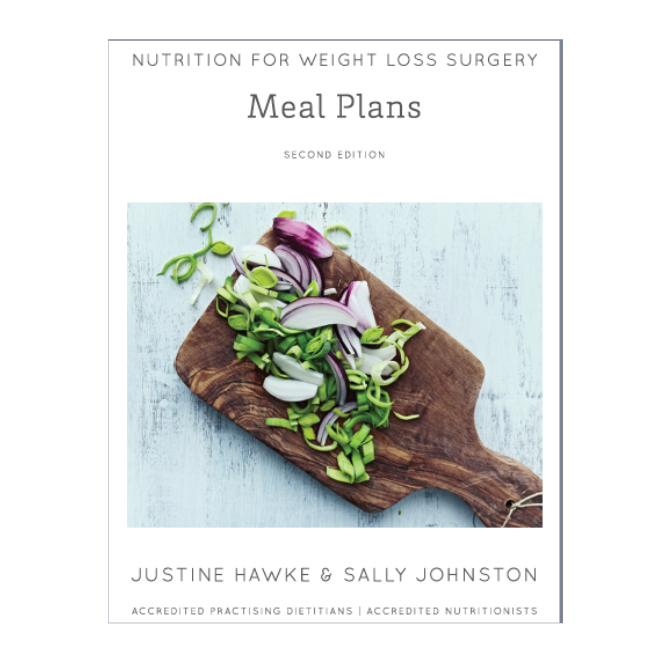 Written by two highly experienced bariatric dietitians who have worked with thousands of weight loss surgery clients, this book is a must-have for anyone who’s undergone a weight loss surgery!